This is definitely one of the more unusual reasons given as an excuse to hurt and kill animals but it's also surprisingly common. Below are two equally important reasons why this claim is absurd. There is zero scientific evidence that plants feel pain - and why would they? Pain is something that both human and non-human animals have acquired through the evolutionary process as a way of keeping us from harm, danger or death. Our pain response causes us to flee or avoid things that could kill us - thus helping facilitate the continuation of our genes and the survival of our species. So why would plants develop this trait when they are rooted to the ground? What would be the use of feeling pain if all you could do was remain stationary and suffer its awful consequences? Not to mention that many plants rely on some part of them being forcibly removed to ensure their reproduction. Whether you're down with evolution or prefer to believe plants were created by a god, what possible reason, what benefit, would plants have to gain by feeling pain? Either way, there is no peer-reviewed scientific evidence that plants feel pain and they have no brain or central nervous system with which to register it. I think one reason the idea sometimes gains traction ​is through websites and news pages using 'Plants Feel Pain' and 'Sorry Vegans' headlines as click bait when reporting on scientific studies on the subject - studies that do sometimes show we might not have a complete understanding of plants just yet. 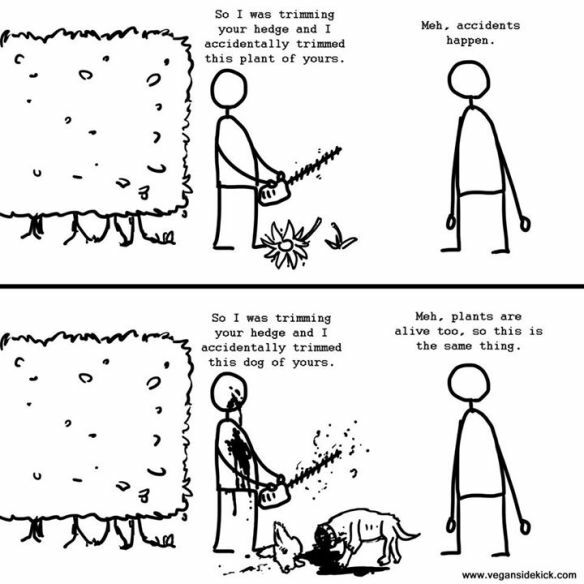 If plants do feel and we want to reduce their suffering, going vegan is the best way to do it. ​not too hard to work out who most of the plants are being killed for. Around half the grain grown globally is fed not to humans (despite the millions who are starving) but to livestock, with forty seven percent of soy and sixty percent of corn grown in the United States alone being fed to the animals we eat. And so when we consume diets of meat and other animal products we are indirectly causing many more plant deaths than if we simply ate them directly. We have to eat something of course, and as we have no biological need to eat animal products but we must eat plants to survive (we die without plants, we thrive without meat) then the single best way to avoid excess plant fatalities is through the adoption of a plant-based diet. 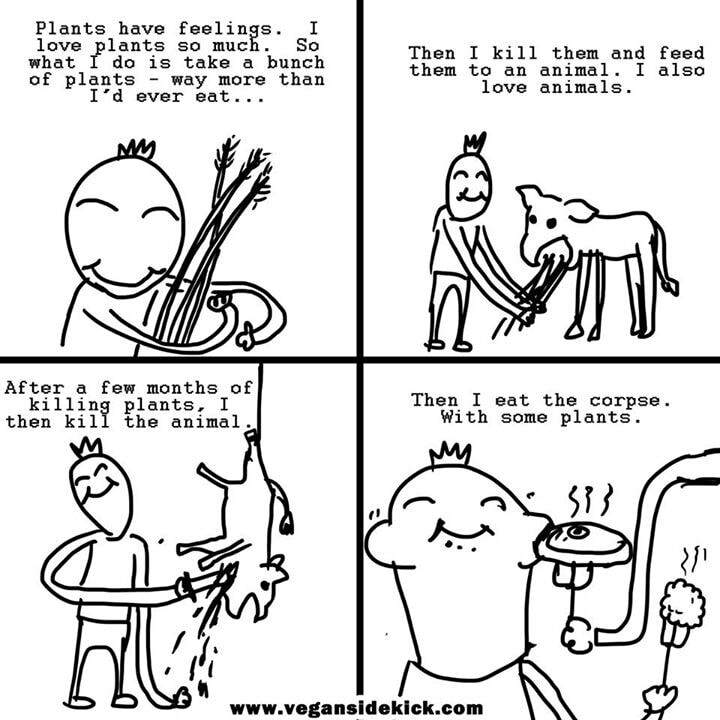 ​A final point to consider is the simple truth that if I picked up a kitten, a puppy, or even a piglet (an animal most agree it's fine to kill) and proceeded to hack at their limbs, mutilate their bodies, or cut open their throats, most people would be shocked and traumatized and do anything they could to stop me. Yet those very same people feel nothing at all when mowing their lawns, picking flowers, or plucking an apple from a tree - these acts are even considered pleasurable (it's almost as if we're naturally herbivores). ​Cutting the head off a pig is not the same as cutting the head off a flower and pushing a knife into a cucumber is not the same as pushing one into a kitten. There's a reason it's uncomfortable to see someone kick a dog but not to kick a tree, and there's a reason why we happily take our kids to pick strawberries but we wouldn't dream of taking them to the slaughterhouse. "An animals' eyes have the power to speak a great language."